Since there are Blackberries in the photo, the word Blackberry is not a pun. Since there is a phone in the picture, the word phone is not a pun. 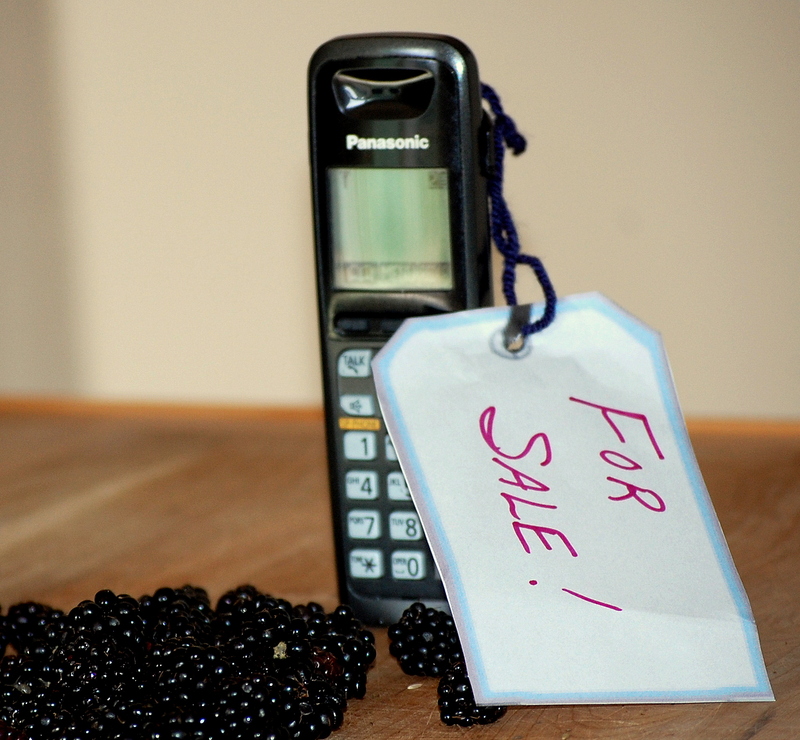 The words Blackberry Phone [together] are a pun, but they left out an essential element of the photo. To make the winners circle the answer had to incorporate the three main elements of the photo: blackberries, the phone, and the sale tag. However, you’re ALL winners in my book. Thanks for playing. Punny Monday wouldn’t be any fun without you! Shelly — this is so easy! Just realized my first guess could not be right….hmmmm…. Barbara — you’re right, you’re wrong! I think this is the earliest I’ve ever gotten in on a Punny Monday. Mumma – -that’s why we’re switching the time zones around. One week they are very early Monday mornings, the other week they are last Monday nights. i cannot for the life of me figure this out! Tilden — your life is worth more to me than this pun, stop! Raven — I guess this one had to come easy or not at all. You must think we’ve all gotten dumber. I bet next week, there will be letter blocks of A’s B’s and C’s and the answer will be e..e.wait, I shouldn’t give it away. I might stand a chance. Nessa — close only counts in horseshoes and hand grenades. Mar — you need a smart phone! I think I know what it might be. Linda — easy as pie! Blackberry pie! Sorry, but I’m not a morning person. Jim — I guess you need an earlier wake up call. Tilden, since a Blackberry cell phone is something ( a single item) I can hold in my hand, I would say it is a noun. Du-uh. I thought it was too obvious for it to be a blackberry with them sitting there so I was trying to make it more difficult. Sigh. Blackberry! I finally guessed one correctly.